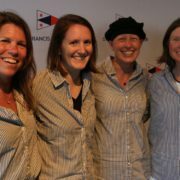 JJ has won two Olympic medals in Sailing in the Women’s 470 class: Silver in the Sydney Olympics in 2000 with crew Pease Glaser and Bronze in the Barcelona Olympics in 1992 with crew Pamela Healy. 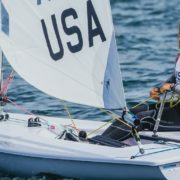 She has also won two World Championships, numerous National and European titles and was the tactician/starting helmsman for the America3 Women’s Team in the 1995 America’s Cup Defender Series. JJ is a four-time recipient of the Rolex Yachtswoman of the Year award, was inducted into the National Sailing Hall of Fame in 2015 and co-authored Sailing for Dummies.